A truly curl defining formula. You’ll love the way this alcohol-free, non-sticky, lightweight product leaves your hair inviting to touch as it defines and locks moisture into every curl. This patented formula penetrates the hair shaft, conditioning as it smoothes the follicle. 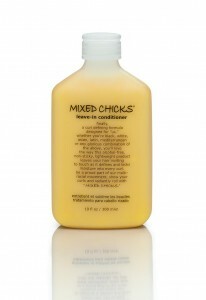 Work Mixed Chicks through wet hair, air dry and style or semi dry with a diffuser. The result is silky, healthy, naturally curly hair.